“The novel truly becomes novel again in Luiselli’s hands—electric, elastic, alluring, new.” --Parul Sehgal, The New York Times"Impossibly smart, full of beauty, heart and insight . . . Everyone should read this book." --Tommy OrangeLonglisted for the Women’s Prize for Fiction From the two-time NBCC Finalist, an emotionally resonant, fiercely imaginative new novel about a family whose road trip across America collides with an immigration crisis at the southwestern border--an indelible journey told with breathtaking imagery, spare lyricism, and profound humanity.A mother and father set out with their two children, a boy and a girl, driving from New York to Arizona in the heat of summer. Their destination: Apacheria, the place the Apaches once called home.Why Apaches? asks the ten-year-old son. Because they were the last of something, answers his father.In their car, they play games and sing along to music. But on the radio, there is news about an "immigration crisis": thousands of kids trying to cross the southwestern border into the United States, but getting detained--or lost in the desert along the way.As the family drives--through Virginia to Tennessee, across Oklahoma and Texas--we sense they are on the brink of a crisis of their own. A fissure is growing between the parents, one the children can almost feel beneath their feet. They are led, inexorably, to a grand, harrowing adventure--both in the desert landscape and within the chambers of their own imaginations.Told through several compelling voices, blending texts, sounds, and images, Lost Children Archive is an astonishing feat of literary virtuosity. It is a richly engaging story of how we document our experiences, and how we remember the things that matter to us the most. With urgency and empathy, it takes us deep into the lives of one remarkable family as it probes the nature of justice and equality today. In her most ambitious work yet, Valeria Luiselli delves into the humanitarian and moral crises at America's southern border with refreshing complexity and stunning results.... The result is an engaging prismatic blend of essay, travelogue and narrative that sensitizes the reader for the magnitude of what is to follow when, at the halfway point, we turn a corner, and the lost children take the wheel.... Luiselli's singular narrative may not resonate with every reader. But for many, it will prove uniquely rewarding  and even life-changing. Luiselli has delivered a madly allusive, self-reflexive, experimental novel, one that is as much about storytellers and storytelling as it is about lost children. Play she in fact can, and does: with structure, cleverly, inventively.... Luiselli holds a doctorate in comparative literature from Columbia, and Lost Children Archive is a virtuosic, erudite performance, referring back to and repurposing the words and strategies of modernist writers like Ezra Pound, T.S. Eliot and Virginia Woolf, metafictional tricksters like Vladimir Nabokov and masters of the difficult, experimental and hyperallusive like James Joyce.... The elegies, foreshadowing the loss of a boy on a train, are riveting. They achieve a lyrical immediacy that makes us feel for those children atop the train. The brilliance of the writing stirs rage and pity. It humanizes us. LOST CHILDREN ARCHIVE is stunningly written, filled with passages --- both factual and invented --- that beg to be read aloud or underlined... It's also inventive in structure, with sections detailing the books and materials the travelers choose to bring along on their trip, a closing section with the Polaroid photos the boy uses to document their journey, and one particularly harrowing chapter that consists essentially of a single breathless sentence from the boy's point of view. In LOST CHILDREN ARCHIVE, Luiselli continues her project of documenting the crises of our time, contextualizing them not only within our country's history but also within an emotional narrative that profoundly illustrates the power of fiction to ignite readers' knowledge and empathy. Luiselli's writing possesses a restless intelligence that weaves disparate lives and cultures into a map of the world.... "Lost Children Archive" builds into a stunning structure of allusion and metaphor and encourages us to think about how fiction reveals links between people as disparate as New York journalists and Central American refugees. Sometimes, though, Luiselli's ideas ride a bit too close to the surface. The anecdotes have titles like Map and Reverberations, and the narrator makes statements on the power of storytelling to arrange "all the chaos around us into a world." Sometimes she fumes at how our ways of documenting the world have fallen short. Still, when this novel allows us to hear its notes ourselves, the music its ensemble of voices creates is beautiful. The most compelling sections center on the narrator and her unease about her documentary project.... The novel's climax � a chapter-spanning single sentence � is a true literary spectacle. Foregoing paragraph breaks, Ms. Luiselli essentially builds a wall of prose across 19 pages. It's the most emotionally draining sentence that will be published this year, and, unlike a wall of concrete, her wall of prose unites the many characters' story lines. For its oxygen-starved first half, structure and literary complexity seem to be of greater interest to Luiselli than storytelling. She weaves in references to numerous other texts, some of which the family has brought along; she details the contents of the seven boxes in the Volvo's trunk; she layers in a book within the book, about migrant children.... The boy's perspective shapes the novel's second half. As the trip morphs into an adventure starring him and his sister, who in their very American safety take needless, stupid risks, the layers and echoes in Luiselli's prose deepen to beautiful, even magical effect.... For the most part, though, their reality remains at a remove from us, as if Luiselli couldn't fully persuade herself of her right to tell their story � to use her words to help us understand and, yes, feel. Would that she had. Because great art, like great journalism, can in fact move people to action. Lost Children Archive unfolds in four parts interspersed with annotated contents of archival boxes belonging to various family members and containing bibliographies, maps, migrant mortality reports, photos and notes. This archive underpins the narrative, a resonant chamber of books and documents from which Luiselli borrows themes and lines that she reweaves into Elegies for Lost Children, a poetic account of migrant kids braving La Bestia, their perilous traintop journey told in numbered fragments.... Lest anyone get upset about artistic license, Luiselli includes a detailed works cited page that sources those quotes, allusions and craft decisions. Does plot matter, when her deep thinking yields vital insights? Her mind is a delight. Lost Children Archive is a retelling of the American road novel, with a twist. In this version, there is no flight from the domestic  the journey has been taken to save a marriage, and the squalling children are in tow. Luiselli is a superb chronicler of children, and the narrator's 5-year-old daughter and her husband's 10-year-old son feel piercingly real  perceptive, irreplaceable, wonderfully odd. The maddeningly relevant political novel is all the rage right now in the Trump era, but what separates Luiselli's book from the pack, is that it manages to be political without being propagandistic, rousing without any didacticism. Though the book is unquestionably timely, it also approaches a certain timelessness, like all great novels, in the hopes of eclipsing their petty political alignments... Luiselli's novel is the kind of book we need right now: one not afraid to dig into the politics of the present, but always with an eye toward posterity.... Lost Children Archive hits the right pitch and finds the right surface, whispering back to us our own questions and concerns, reverberating with the headlines of the present and the great art of the past. The thematic layering of absences and silences, and the real and invented meta-texts sown throughout the narrative, make this a highly conceptual novel. Ms. Luiselli has a wonderful mind, and there are pleasures in watching her slowly unfold her ideas to reveal hidden resonances.... But her bookish approach fits uncomfortably with the immigration crisis, turning the subject of missing and separated children into a literary device. To address this problem Ms. Luiselli makes a change in the novel's second half, giving the narrative over to the couple's children and imagining their perspective on the road trip.... In truth, the gambit doesn't entirely work. Though the children bring the story a much-needed burst of vitality, they labor under their metaphoric burden.... This is a searching, cerebral, nobly intentioned novel that never manages to move from the abstract into the real. There is so much truth in this novel. We learn about children journeying across the border, riding La Bestia, about how many of them don't make it across, how many perish in the desert. It is a story, but also a response: to the articles about migrant children and immigration crises, to literature, to nonprofits and schools doing this work, to the emptiness across the American landscape, to ideas of family, and to ideas of choice. 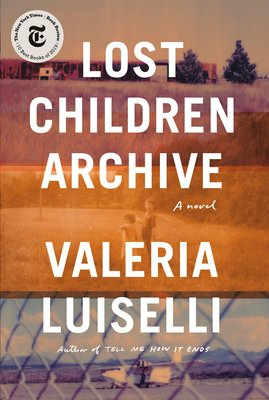 Luiselli weaves in many texts and, in some ways, the novel is like a love letter to literature.... Lost Children Archive is a beautiful text, in which everyone is searching for connection and reconnection. There's a lot to parse in the novel, many details in service of a bigger picture asking for more consideration, more mercy and more action.